Brigadier General Charles Edward Stewart CMG, (commanding officer 154th Infantry Brigade, 51st Division) is killed in action at age 47. With his intelligence officer (Lieutentant Frederick Neill Edmonstone Kitson, Black Watch) he is killed while they are walking through Houplines when a chance shall bursts within a few feet of them, killing them both. It is the only shell that falls in the vicinity today. Lieutenant Kitson is the son of the Reverend John Francis Kitson and dies at age 30. Today 34th Squadron never has less than six machines in the air, most of them doing several hours of artillery spotting. 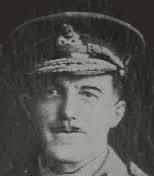 Lieutenant Colonel Cusack Grant Forsyth DSO (Northumberland Fusiliers commanding 6th Yorkshire Regiment) is killed at age 29. He is the last of three brothers who are killed in the Great War. Captain Bertram Saxelbye Evers (West Yorkshire Regiment) is killed at age 24. He is the son of the Reverend E Evers. Second Lieutenant Bryant Wynne Yorke-Lodge MC (Lancashire Regiment) is killed in action at age 20. He is the son of the Reverend J A B Lodge and was educated at Liverpool College, Rossall School and Brasenose College, Oxford. Second Lieutenant Frank Radcliffe King (Liverpool Regiment) is killed in action at Salonika at age 30. He is the son of George Edward King JP (Alderman and Guardian for the Borough of Lambeth and Mayor of Lambeth). Private John Charles Howe (Bedfordshire Regiment) dies of wounds at age 21. His brother will be killed in November 1918. Private Fred Harrison (West Yorkshire Regiment) is killed at age 23. His brother will be killed in four days.